Micromax Canvas Magnus (Quick Review) powered by MT6589T turbo processor was silently launched few weeks back in the shadow of Full HD device Micromax Canvas Turbo , flaunting a competitive price-tag of Rs. 14,999. Karbonn Mobile’s latest offering, Karbonn Titanium S7 (Quick Review), exhibits same pricetag, and one up with Full HD display. Let’s compare these two devices to know the hits and misses, and to determine which one will be more suited to your needs. The Micromax Canvas Magnus sports 720p HD display with pixel density of 294 ppi. The Karbonn titanium S7 features same sized 1080p full HD display with 441 pixels per inches. In practical scenario, the difference between such high pixel densities is not that apparent on a 5 inch displays, but there does exist a difference. The display quality depends on various other parameters like color saturation, contrast ratios, brightness, viewing angles etc. The Micromax Canvas Magnus with its IPS display will provide you with good viewing angles. The Karbonn Titanium S7 uses OGS technology, which will definitely enhance your touch screen experience by eliminating the air gap between touch layers. The display of Titanium S7 definitely seems better. The difference won’t be that well pronounced if you haven’t experienced both type of displays. The processor on both of these phones is same. Both of these employ the MT6589T turbo Quad core chipset clocked at 1.5 GHz and assisted by PowerVR SGX544 MP GPU. With our past experience with this chipset on Micromax Canvas Turbo, Gionee Elife E6 and Zen Ultrafone Amaze FHD, this chipset showed lag while graphic intensive gaming at full HD resolution. The Frame rate was around 30 fps which is much less compared to 60 fps obtained on 720p HD display devices. Thus we expect Magnus to be more efficient. The camera specs for both of these smartphones are almost similar and considering the 13 MP unit we reviewed in Titanium S9, you can expect similar camera performance. Canvas Magnus sports 12 MP Autofocus camera at the back with LED flash and a 2 MP camera at the front. The Karbonn Titanium S7 features 13MP/ 2MP camera combination. The Micromax Canvas Magnus has 4 GB of internal storage, but it will provide you with the option of transferring apps to the external SD card as well. The Karbonn Titanium S7 will provide you with 16 GB of on board storage which can be further extended to 32 GB using a MicroSD card. Since the Internal SD card is faster to access, and not all apps can be transferred to external SD card, Titanium S7 is more palatable option. The 2000 mAh battery on Magnus will provide you with 7 hours of talk time and 180 hours of standby time. The titanium S7 will provide you with only 4 hours of talk time on 2G and thus Magnus has a huge advantage in this regard. It will be advisable to carry a battery bank for both of these phones, but most people don’t want to worry about running out of charge. 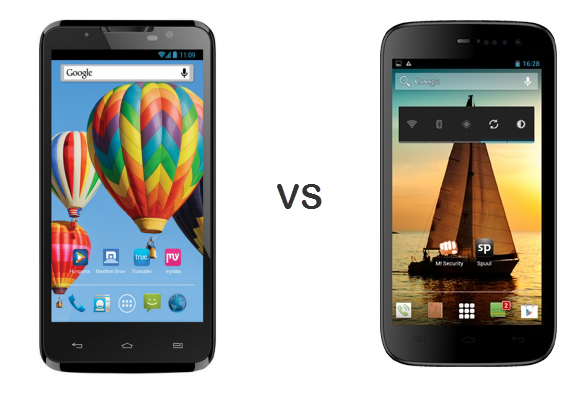 Both of these phones support Dual SIM cards and run on Android 4.2 Jelly bean operating system. The body thickness is almost same for both of these phones but Magnus will provide you with metallic finish. The removable aluminum back door gives Canvas Magnus a premium look. If you can settle for a 720p IPS LCD display in place of Full HD OGS display, Micromax Canvas Magnus should be a better option. Battery backup will be a limitation in both of these devices, but Magnus will fare much better. Internet browsing time will be better on Micromax Canvas Magnus due to less taxing display. Karbonn Titanium S7 will provide you with a Full HD display at a competitive price, if it’s the top priority on your list. s7 specs are not confirmed.